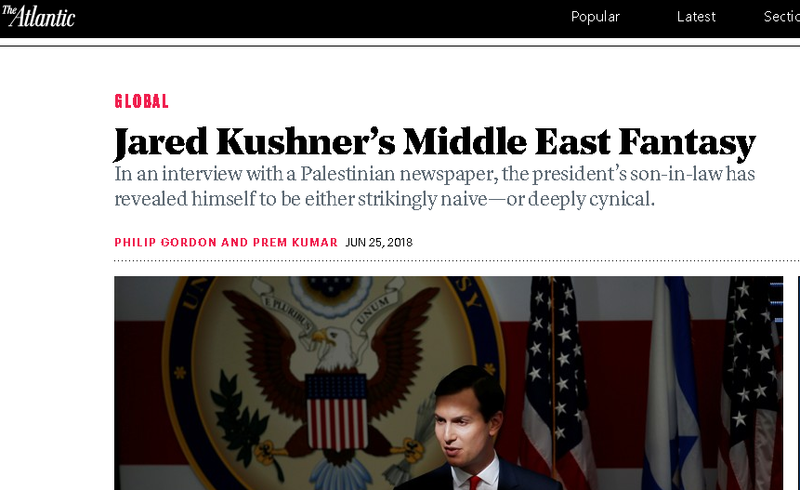 The new article in The Atlantic, Jared Kushner’s Middle East Fantasy by former Obama administration Philip Gordon and Prem Kumar, is fascinating - but not because of their analysis. They argue that the Kushner interview in Palestinian newspaper Al Quds shows that he is hopelessly naive or, as they say, deeply cynical. The first fantasy is the notion that the obstruction of Palestinian President Mahmoud Abbas—who refused to meet with Kushner on his latest trip—can be countered by taking the peace plan “directly to the Palestinian people.” Kushner suggests that Abbas is avoiding him because he’s “scared we will release our peace plan and that the Palestinian people will actually like it.” That’s not likely. Abbas is indeed unpopular with most Palestinians—his approval rating hovers just above 30 percent—but it’s hardly because he’s too hardline on Israel. In our own extensive discussions with Abbas and his negotiating team as White House Middle East advisers during the Obama administration, we found them deterred most of all by the fear they could not sell further concessions to their people, who were seething about years of continued Israeli settlement expansion, land confiscation, and increased limits on Palestinian movement. Did it never occur to these "experts" that Abbas was using his people as an excuse not to make peace, and that in fact the people want to end this useless situation already if only he would accept a couple more of Israel's security demands? If there was peace, Abbas would actually have to govern - balance the books, no longer rely on foreign aid for nearly everything, actually build institutions on his own instead of relying on European NGOs. But a long as he keeps refusing any peace offers, he keeps what he wants - Palestinians in the headlines, occasional flare-ups, boundless opportunities to bash Israel. The biggest proof that Abbas doesn't want peace is his pretending that his people are against it. He never pushed real peace with Israel in any speech, any statement - he only bragged that he hasn't changed the PLO's positions since 1988. Our "experts" have been fooled by believing Palestinian leaders uncritically instead of using some of the skepticism they dedicate to Netanyahu to Abbas as well. Kushner’s second fantasy is the idea that he and the administration he represents are better placed to succeed than all their failed predecessors—a goal that seems to animate Trump as much as achieving Middle East peace itself. But while it is already clear that Trump is a terrible dealmaker who has yet to conclude any significant international agreement (the unilateral concessions to North Korea in exchange for a vague pledge to “work towards” denuclearization do not qualify), Middle East peace may be the issue on which he is least well-placed to succeed. While all U.S. administrations have always been closer to Israel than to the Palestinians, they all at least tried to play the role of honest broker in the name of finding some workable compromise, and were seen as necessary partners in the eyes of Palestinians. How has this "even handedness" worked out so far? And in fact, the Obama administration demanded from Israel far more that they demanded from Palestinians, at least in public - which is where it matters. Even so, the Palestinians spurned them. So a new approach is not such a bad idea. The Obama approach failed spectacularly. And yet he still blamed Israel. The third Kushner fantasy is that the Arab Gulf states, Egypt, and Jordan will help him overcome these major challenges. ...There is no doubt Kushner heard positive words from Arab friends in private meetings on his just-finished four-day trip to Jordan, Saudi Arabia, Egypt, and Qatar, before going to Israel. But he should not hold his breath waiting for those leaders to publicly embrace positions on peace that the Palestinians—and the vast majority of their populations—reject. This is especially true on the issue of Jerusalem, where any softening of the Saudi or Egyptian backing for Palestinians would be immediately denounced—and taken advantage of—by their rivals in Iran, Qatar, and Turkey. It's happening already. These "experts" are not looking at Gulf media. There is a sea change. There is public lip service to Palestinians but the anger at the Hamas/PA split has been growing for a decade. There will always be a reticence to publicly embrace Israel but the pro-Israel tilt of Jordanian, Egyptian, Saudi and Bahraini leadership is hard to ignore. Iran already accuses Saudi Arabia of being "Zionist." It has for a long time. Has it hurt the Saudis at all? The fourth fantasy is that the Palestinians can be bought off with economic assistance to compensate for political losses. In his interview with the Palestinian newspaper, Kushner suggested that the Trump administration could “attract very significant investments in infrastructure … that will lead to increases in GDP and we also hope a blanket of peaceful coexistence.” Putting aside that the Trump administration has not even made or been able to attract major investments in U.S. infrastructure, which makes one wonder about the West Bank and Gaza, this emphasis on economic issues has been tried unsuccessfully many times before. During the Oslo era of the 1990s, then the 2002 Roadmap for Peace and the Bush administration’s Annapolis process, and finally Secretary of State John Kerry’s effort during the Obama administration, successive U.S. administrations have tried to enhance the prospects for peace by improving conditions on the ground. It is of course laudable to promote much-needed economic development in the West Bank and Gaza, but Kushner should know by now that prosperity will never substitute for political peace. The key issues remain borders and sovereignty; security; settlements and occupation; refugees; and Jerusalem. No Palestinian leader can survive in office by promising economic benefits alone. The media leaks of the Kushner/Trump plan is far, far more expansive and global than anything the previous peace pushes had. Because they were all thinking in terms of economic benefit only for Palestinians, and not economic benefits to the entire region. Ordinary Palestinians who have not yet been thoroughly brainwashed by decades of incitement by "peacemaker" Abbas just want to raise their families in peace. Arguably, the biggest reason things are relatively quiet in the West Bank is because some 100,000 Palestinian Arabs work in Israel - for wages that are double what they can make in the territories - and this is a significant part of their GDP. They aren't the BDSers that Gordon and Kumar pretend they are, based on Abbas' lies about how his people are so radical and are forcing him to reject peace. They want to make money, they want easy access to jobs, they want good schools and hospitals. Finally, there is the problem that Israelis under Prime Minister Benjamin Netanyahu will almost certainly never agree to the sort of deal that would be necessary to make Palestinian or Arab acceptance even remotely feasible. This is a non-sequitor. Here is a plan that Netanyahu can almost certainly accept - it is the Palestinian leaders who will reject it. Which they did for the plans that were far more tilted their way. Why blame Netanyahu? Notice the bias: Palestinians rejecting peace plans is Israel's fault because Palestinian demands and preconditions are reasonable and Israel's are not. This is not analysis - it is an after the fact attempt to pretend that the Obama vision still has relevance. Because Gordon and Kumar are dinosaurs. They are so certain that their vision of a two state solution is the only viable one that they are too blind to admit that there is a chance - still remote, of course, but a chance - to build a new Middle East based on shared interests, on Israel cooperating more and more with Arab states, a model that can eventually benefit Palestinians as well. As long as they continue their rejectionism, the plan is indeed to sideline the Palestinians until the Palestinians themselves understand that they can partake in the new economic boom that can result from closer Israeli ties with the major Arab states. I'm guessing, but I would think that the plan will include Arab states allowing Palestinians to become citizens, and many would take advantage of that to move to the Gulf and enrich the Gulf economy and also to send money to family back home. Saudi Arabia wants to modernize - Palestinians are the least lazy, best educated and most motivated Arabs that can help them out. Gordon and Kumar are looking at the Middle East through the glasses of their own Obama fantasies, not reality. From what I can tell from leaks about the plan, it is astonishing in breadth and scope, as well as audacity. We know the Obama methods crashed and burned - why try to make the same mistake dozens of times? As unlikely as the Kushner/Greenblatt/Trump plan is, it is generating far more interest from Arabs than anything Obama ever did. It is more ambitious. And it correctly looks at the entire region rather than continue the utterly useless Oslo model where the Palestinian leadership is encouraged and rewarded to always reject peace in hope that something better will come along. In the Oslo days, Palestinians could tell the Arab world to reject any plan not to their liking. And they did, often, to buttress their positions. Those days are very, very numbered - but Western diplomats haven't caught up with reality. The frustration in Palestinian media and leadership with Jordanian and Egyptian deals with Israel, and with Saudi rejection of Palestinian intransigence, is palpable. But invisible to these "experts." Think about it - these two former Obama dinosaurs are unwilling to even support a peace plan. Their own plans encouraged terror and intransigence, but anything to them is better than the idea that Trump's team can make peace. "Jewish fanatics harass Muslim women at Al Aqsa"
What the Palestinians call "incitement"